This table was done as a commission for a dear friend. The design is the (old) logo of a nonprofit in Thunder Bay – the Anishnabek of the Gitchi Gami (who, incidentally, do really amazing work). This was a really great project to work on for a few reasons. First, I love that the mosaic has meaning that goes beyond that “hey, this would look nice” approach that I usually take with my work. That deeper sense of purpose really drove me throughout this project. Second, and this one is far more superficial, it was such a treat to work with glass that wasn’t out of the scrap bin. Especially the blue. I’m obsessed with that blue. I’m not used to having such freedom when it comes to choosing colours, but the super helpful folks at Northern Art Glass were really patient with me as I pulled glass sample after glass sample off the shelves (and trust me, their patience is no small feat given how indecisive I am!). And third, it was really nice to be able to work on a larger project again – I’d been itching to do one for quite some time and this was my chance! The table took a lot longer than I anticipated, partly because of the prep work involved before starting to glue the pieces down (filling grooves in the wood, sanding, painting), and partly because the style of the mosaic is a fairly big departure from what I usually do. 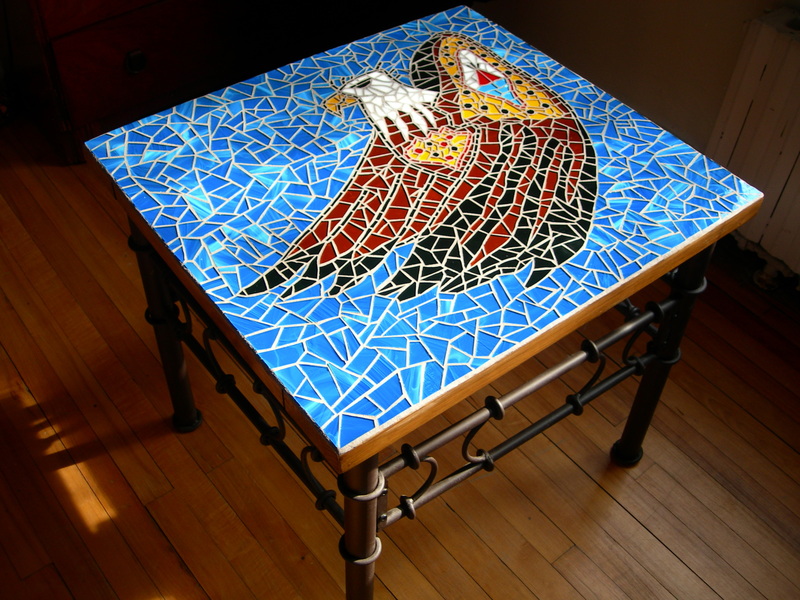 Normally I try to cut as little as possible, which means my mosaics tend to take on a life of their own as they develop, but with this particular table I had to cut nearly every single piece. 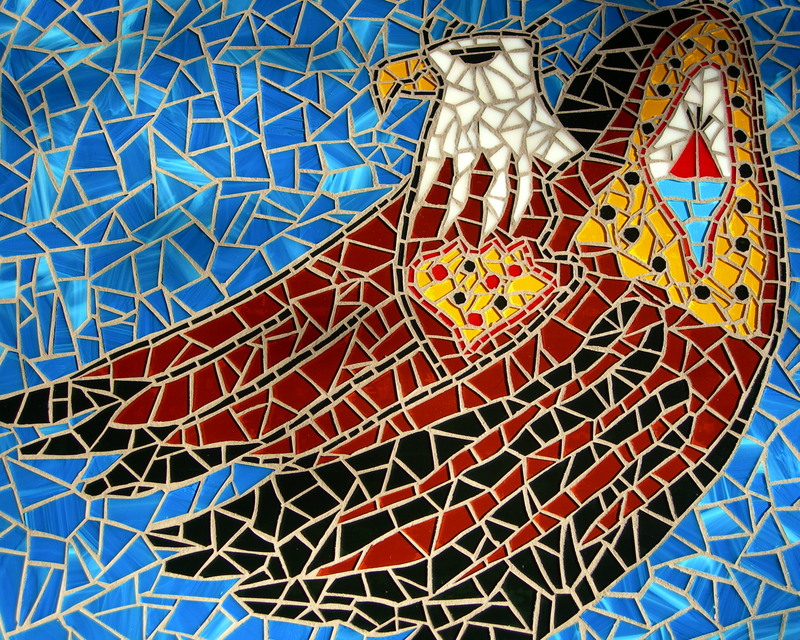 I don’t think I achieved that more whimsical and random feeling that most of my mosaics have, but I think in this case it works. This project was definitely a challenge, but a welcome one, and I feel pretty honoured to have been able to work on such a special mosaic.